Added 31st May 2012. Last edited 13.1.2013. Minor edits 14.2.14, 14.4.14. New info. added 17.2.17. Born on the 8th of May 1833, the son of Thomas Chamberlayne, Esq., of Cranbury Park and Weston Grove, J.P., D.L., High Sheriff of Hampshire (1855), and his wife Amelia, daughter of General Denzil Onslow, late of the Grenadier Guards, of Stoughton House, Hampshire. [PB: He was baptised 3 July 1833 at St Mary Bryanston Square. 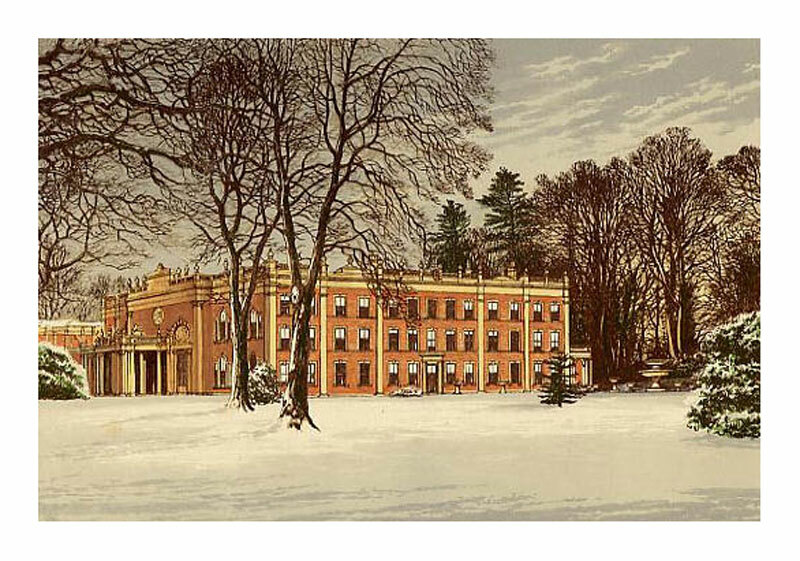 FamilySearch says DTC was born 9 May 1833, at Cranbury Park, Hants: https://familysearch.org/tree/person/K881-G3J/details (accessed 17.2.2017). It might also be worth looking at http://thepeerage.com/p68685.htm#i686846 (accessed 17.2.2017), which I have not done in any detail. I notice there is very little about DTC himself there, and only a vague guess about his dates, but plentiful information about his antecedents. General Onslow is listed here. 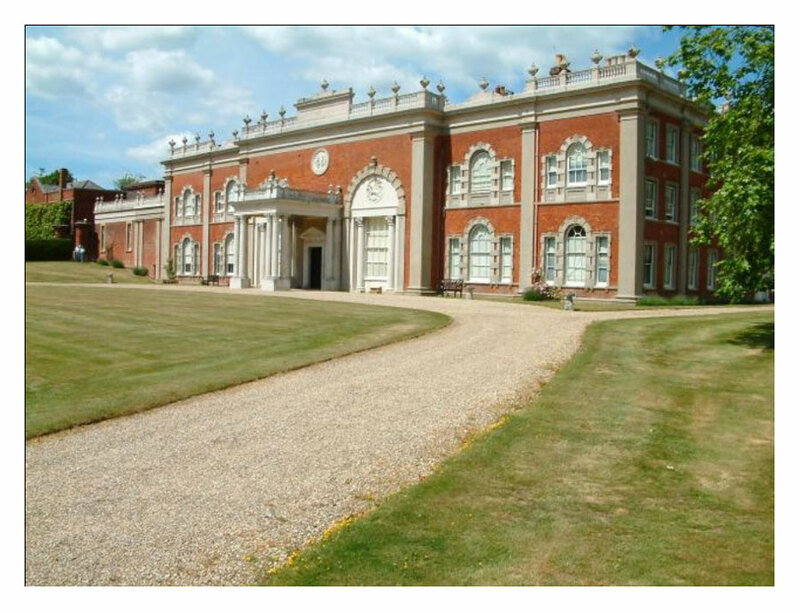 Cranbury House, Hampshire. A recent photograph and a woodcut from Morris's Country Seats(1880). "The house stands on a hill at 85 metres above sea level and from the extensive grounds beautiful views are obtained of Southampton Water and the Isle of Wight to the south.... Of the interior, Nikolaus Pevsner wrote that it was an 'unforgettable experience' to behold the hall with its coffered tunnel-vaults to the full height of the house and the beautiful ballroom." Tankerville Chamberlayne, 10 months [?]. The location of his childhood home with views over Southampton Water, and his father's enthusiasm for sailing (Thomas Chamberlayne sailed his yacht Arrow in the first America's Cup race (1851), when DTC was about 15), is likely to have influenced DTC's decision to live in Dartmouth after he left the army. TC was also active in cricket, coursing, and in hunting, an activity naturally associated with the cavalry. The estate was inherited by Denzil's younger brother Tankerville Chamberlayne in 1876, Denzil himself having died three years earlier. On the death of William Chamberlayne in 1829, [Canbury Park] passed to his cousin Thomas Chamberlayne. Thomas (1805 — 1876) was a keen yachtsman who sailed his yacht, Arrow, in the inaugural America's Cup race in 1851. This race was won by the America. 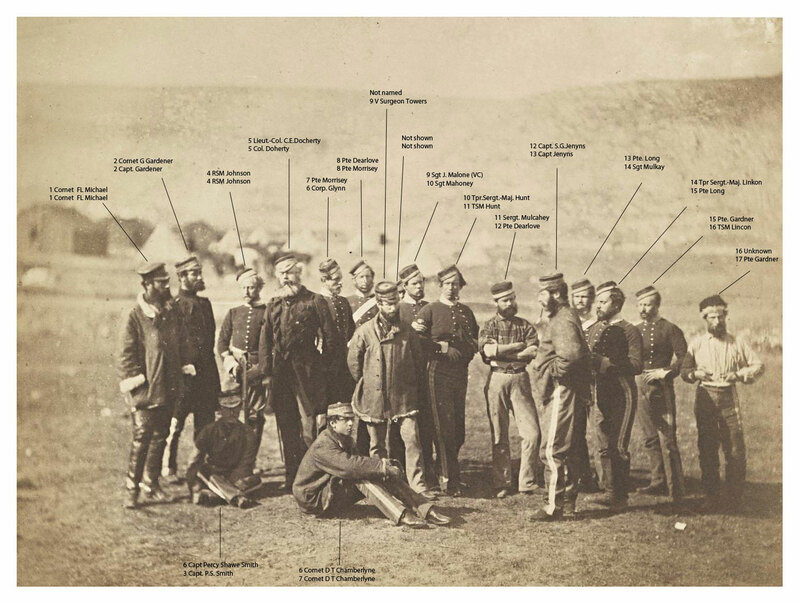 See The Field of May 1, 1886, and The Graphic of June 18, 1887. In 1852 The Arrow beat the famous America in the race at Ryde for the Queen's Cup. He also played cricket for Hampshire and was a great hunting and coursing enthusiast, who built both new stables and a cricket pitch at Cranbury Park. On his death in 1876 the estate passed to his son, Tankerville Chamberlayne. Tankerville Chamberlayne was also MP for Southampton from 1892 until 1896, when he was disqualified for electoral fraud in the 1895 General Election; despite this he was returned to office in 1900 until he lost his seat in 1906. Cornet in the 13th Light Dragoons: 11th of March 1853. "My Dear Jack — I write these few lines to say that we left Hounslow to-day and arrive at Chichester on Monday, and expect to embark on Thursday or Friday. P.S...The Major, Jos, King, Smith, my brother, and Chamberlayne are with this squadron. My troop embarked on the 8th of May, 1854, on board the good little ship the "Mary Ann," No. 42, the B troop on the "Negociator, " the E on board the "Monarchy." I forget the name of the ship or ships that took the rest of the troops. Capt. Oldham and Lieut. Montgomery on the first named vessel, Capt. Soames Jenyns and Lieut. Jervis on the second, Capt. Arthur Tremayne, Lieut. Percy Smith, Assistant Surgeon Armstrong, on the third, Colonel Doherty, Major Gore, Capt. Goad, Lieut. Goad, Cornet McLean, Chamberlin and staff officers on the other vessel or vessels. Rode with "E" Troop during the Charge, under the command of Captain Tremayne. I write a few lines to give you an account of the battle of Balaklava, which was fought on the 25th, between about 30,000 Russians and the whole available force in the valley of Balaklava, being certainly not more than 10,000, of which 5,000 were Turks, and those of little use. Our force included staff, artillery, marines, and, indeed, every man who could be of any use. There appeared to be some slight mistake with respect to the orders, but... we (cavalry) were formed upon parade on Wednesday morning, at five o'clock, and remained so until seven, about which time the guns on the hills round the valley began to play upon the enemy. These guns number about eight, and are played by twos at intervals upon the hills, commanding the north and east of the valley; they are ship guns, are entrenched, and are entrusted to the Turks. As soon as the firing commenced on the hills, the artillery and cavalry who had not turn in went to protect them, and the Turks in the valley and one regiment of Highlanders prepared for business and formed in line, protecting the roads to Balaklava. The 13th had to protect a battery of horse artillery, and formed up behind the hill on which it was placed; but we were in a tolerably safe position, only now and then catching a round shot and some splinters from shells, which wounded a few horses, but did not injure a man. After the firing had continued some time, the Russians advanced a little, being in great force, and the unfortunate Turks 'cut and run' — with all speed, when the enemy was at least 600 yards off, [p.135] and did not even spike the guns — which, however, I believe, was fortunately done by our own artillery. Consequently, the enemy obtained possession of the heights, but it did not do them much good, as the valley is so broad that nothing is within of shot from them. The artillery and cavalry then retired slowly back to their camp, when they formed up behind it. The Russians sent two strong forces of cavalry down towards the camp. The former was met by the regiment of Highlanders, the enemy at first fancying they were Turks; but they were soon undeceived, as they were met by an incessant and galling fire from the brave Scots, who did not take the trouble to form square, but remained merely in line, the Russians retiring in double quick time. The second force, sent against the camp, were met by the Scots Greys, backed up by the Royals and Enniskillens, who, after a short but rather desperate encounter, forced them to retire. After this we formed up in line — that is, the light cavalry and the "heavies" — behind on the hills. The enemy had possession of the low part of the valley (the valley beyond the hills), a very narrow long one, where they formed up their cavalry immediately behind 13 large guns, and within range of two of the four hills they had possession of. Now, began the slaughter of the day — as I can call it nothing else. Lord Lucan, who said he had Lord Raglan's authority for so doing, ordered us to charge the enemy, about a mile distant from us, so at it we went in earnest, trotting the first half and galloping the last part of the distance. Though the heavy brigade was formed up behind us, they had no orders to support us, so did not move. The sketch I send you will show the crossed fire to which we were exposed — round shot, grape, shell and bullets. The 13th and 17th were in front, the 8th and 11th behind, and then the 4th. At the outside, I should think there are not more than two-thirds of the light division of cavalry left. The 17th have about half left. The 13th as follows: In the morning we turn out 9 officers and l 10 men, or within five of that number; at about three o'clock in the afternoon, after the charge was over, we could only find nine mounted men out of the 120. At last the horses began to drop in, some without riders, others with, but most of them were brought back by Turks and camp-followers. To-day we reckon our loss thus: 3 officers, 24 men, and 84 horses missing; and 3 officers, 26 men, and 5 or 6 horses wounded. This is the loss in the 13th. 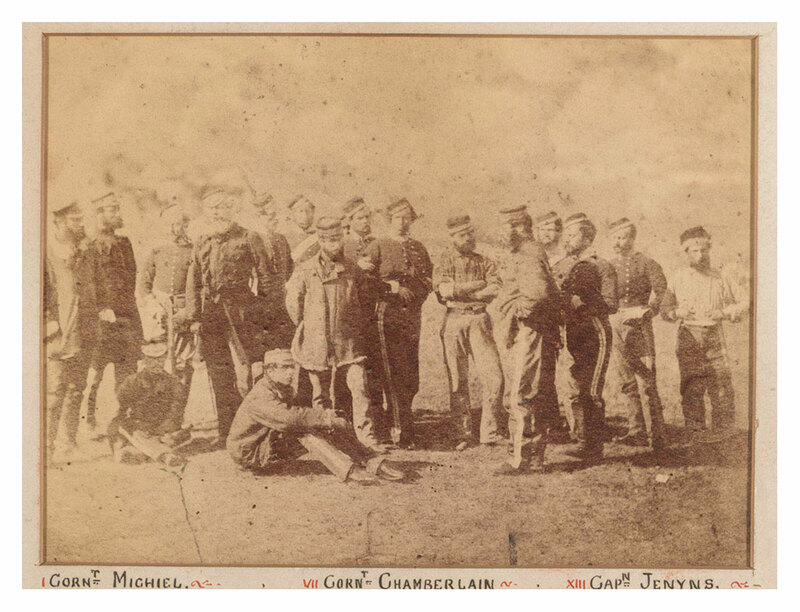 In the morning we had nine officers with the regiment, viz. : Captain Oldham — killed, horse missing. Captain Goad — badly wounded and missing, horse killed. Captain Jenyns — wounded slightly, horse killed. Captain Tremayne — escaped unhurt, horse killed. Lieutenant Smith — wounded slightly, horse safe. Lieutenant Jervis — escaped unhurt, horse killed. Cornet Montgomery — missing, reported dead, horse missing. 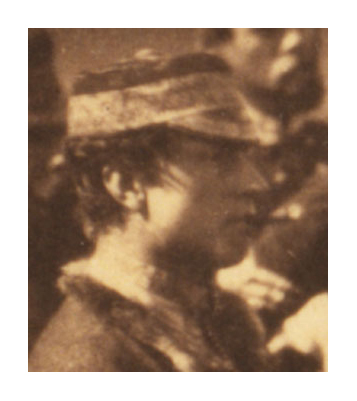 Cornet Goad — wounded slightly, horse killed. Cornet Chamberlayne — escaped unhurt, horse killed. Our Colonel [Doherty] was unwell, and not with us, as also our volunteer, McNeill. Capt. Oldham is known for certain to have been killed, and Capt. Goad and Cornet Montgomery we have too much reason to fear so. Capt. Jenyns and Cornet Goad are hurt only by severe falls from their horses when they were [p.136] shot, and Smith was wounded by a lance in the breast, but so slightly as not to incapacitate him from duty. Cornet Goad is the only one unfit for duty. I received a lance thrust in the stomach from the right, which fortunately just missed me, but broke my cap-pouch and ripped up my revolver case. I also received a sword cut on the arm, but it fell very lightly, as I shot the Russian dragoon through the head when his arm was raised. My poor charger Pimento was shot through two places in the flank with Minié balls, and one through the body with grape on our retiring. He was only just able to carry me out of the range of the enemy's batteries when he fell to rise no more. The enemy's cavalry was in immense force. I had very many hairbreadth escapes (thanks be to a merciful Providence). Returning was the worst part of the business. I was nearly the last out of about 35 that started together to return, but I only saw nine when we got out of range. Men and horses fell about like nine-pins; it was an awful sight. I could have killed three or four more Russians with my revolver, but as they were a little detached from the main body I thought it would look too much like murder. Having no more time, believe me, your affectionate son. "Captain D.T. Chamberlayne... greatly distinguished himself by his coolness and courage in the fatal charge at Balaclava. He rode up to the enemy's guns on the right hand side of Lord Cardigan, at the front of the regiment, and in fighting his way out with the few of his gallant comrades who remained, his favourite charger was shot three times through the body before it fell, and then its gallant rider was seen standing within range of the Russian batteries, the ground all around being ploughed up by shot and shell, coolly taking off the saddle and holsters, and with them on his arm he walked quietly up to the rising ground where what still remained of the gallant "600" had formed. It was there that he was received with a burst of cheering." Lieutenant (later Captain) Percy Smith, relates the story in slightly different terms. When he (Smith) was on his way back, he passed Lieutenant Chamberlayne sitting by the side of his dead horse — a very favourite one, named "Pimento", and Chamberlayne asked him what he had better do. He was advised to take off the saddle and bridle and make the best of his way back, for, "another horse you can get, but you will not get a saddle or bridle so easily." This advice was followed, and placing his saddle on his head he returned along the valley, threading his way amongst the Cossacks who were busily engaged in pillage and killing the dismounted and wounded men. He was most probably taken for a pillager and to this, no doubt, owed his life. Lieutenant, 13th Light Dragoons: 8th of December 1854. [O]n the 2nd of December, they sent us an order to move down to our present position, so that we might be near our supplies. You never saw such a sight as our march! The horses were so weak that riding them was out of the question, and the brigade had to put their pride in their pockets and walk down, leading their horses. Even then about ten had [p.173] to be left. We are now about a mile from the town, so we get our forage regularly, and the horses are beginning to pick up a little, with the exception of those that were too far gone. Our effective strength is seventy men and twenty-eight horses! There are fifty horses on the ground altogether, but the remaining twenty-two are in the sick report. What a regiment! They employ 500 horses of the Heavy Brigade every day in taking up rations to the infantry, so out of our twenty-eight horses we have to find our proportion of the outlying picquets, and also to draw forage for ourselves and the heavies. Just as much as we can do. Jos Tremayne and Jenks are both here and flourishing, and the subs, are Jervis, young Goad, Chamberlayne and myself. This is desperately dull work and not very luxurious. I confess I should prefer Atherstone [Warwickshire, where Percy Smith and Thomson hunted together], and we might really just as well be there for all the good we can do at present. Owing to the neglect of the commissariat officers' reports, the Light Cavalry have since that advance lost more than half the horses, and Lord Raglan then says it is the fault of the officers for not looking after things, and that the men have been selling their forage to the French. You can imagine the rage of Jenks and Jos when Lord Lucan told them what Lord Raglan said. Left the Colonel, Jos, Jenks, Percy, Jervis and my brother there, all well; Chamberlayne too. [PB: From Soame Gambier Jenyns (the "Jenks" listed above), 2 January 1855. "We have the best of it now, and expect to see the inside of Sevastopol very soon. I hope they will send out some cavalry soon, as we are too weak to gammon [PB: Meaning? Summon up?] a trot even, and we have only fifty-two nags left; about the same in all light regiments, the heavies a shade better in numbers. Our chief, Jack, won't do at all in any way. I wish you would exchange with him, only he would not do for the hounds either, I suspect. He never moves out of his tent, lives with the vet., Firth and Chamberlayne, and don't do at all in the field. DTC returned to England on a "Medical certificate" on the 10th of July 1855. Captain, 13th Light Dragoons: 8th of February 1856. On to half-pay: 20th of November 1856. Restored to full-pay on augmentation [meaning? ]: 9th of October 1857. Retired, by the sale of his commission, on the 7th of December 1858. Lieutenant in the Hampshire Yeomanry Cavalry: 2nd of January 1862. Entitled to the Crimean medal with clasps for Alma, Balaclava, Inkerman, Sebastopol, and the Turkish Medal. The shako he wore at Balaclava was presented to the Regimental Museum of the 13th/18th Hussars in 1980, after having been previously in the possession of an English militaria collector. Photograph annotated with two keys. Above, the key printed in the Regimental History, p.363. Below, the NAM key. Sergt Major Linkon (Reg. 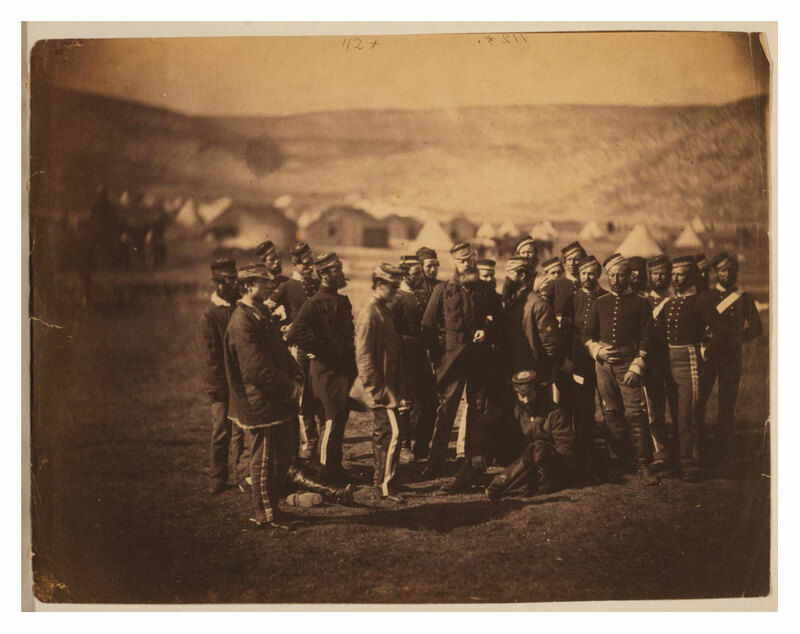 Hist.no.15), could not have been present as he was a prisoner of the Russians at this time (mid-summer 1855). "Not shown" means there is no outline of the man in the key. "Not named" means there is an outline but no number or name. "Unknown" is as in the original key. 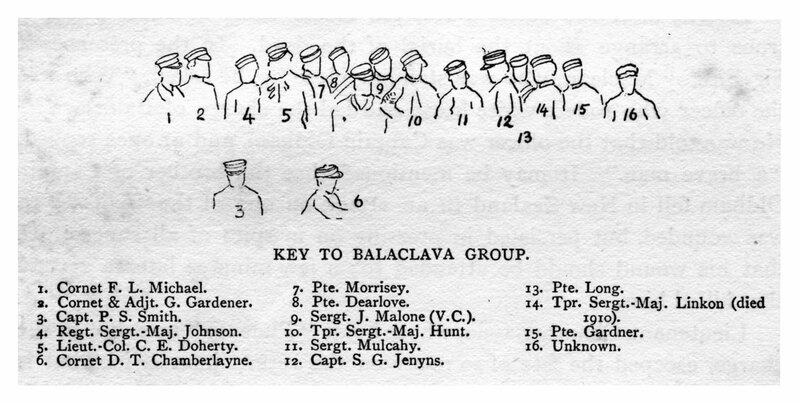 Key in the Regimental History of the 13th Light Dragoons (date), p.363. Clicking on this image will enlarge it somewhat. There is a high resolution image here. On the 10th of June 1867, he married Frances Selina Bourke, daughter of Thomas Bourke, Representative of the Bourke of Ury [meaning?]. FamilySearch says the marriage of DTC and FSB took place 26 Feb 1867 at St George's, Hanover Sq., Middlesex (https://familysearch.org/tree/person/K881-G3J/details (accessed 17.2.2017), but no sources are attached. [PB: FamilySearch's tree suggests they were 1st cousins, since his mother (Amelia Onslow) was the sister of Frances's mother (Selina Onslow), their parents being General Denzil Onslow (1770 — 1838) and Sophia Lushington (1784 — 1860), who married in Wimbledon, Surrey, 20 September 1800. "Cousin marriage has often been chosen to keep cultural values intact, preserve family wealth, maintain geographic proximity, keep tradition, strengthen family ties, and maintain family structure or a closer relationship between the wife and her in-laws.... First-cousin marriage in England in 1875 was estimated by George Darwin [Charles Darwin's son] to be 3.5% for the middle classes and 4.5% for the nobility.... Queen Victoria and Prince Albert were a preeminent example." Holywell House, Swanmore, near Winchester, Hants, depicted in 2017. DTC's wife Frances Selina Bourke is said to have been born here in 1847. His family lived in Canbury Park, about 12 miles away. DTC resigned his commission: 31st of January 1868. An infant daughter is said to have been buried in the same churchyard (see obituary below). [PB: This was Frances Rose Caroline Chamberlayne, said to have been born 9 May 1868, St George's, Hanover Sq., Middlesex, England. She died 4 Sep 1868, and was buried September 1868 in Dartmouth, Devon, England (https://familysearch.org/tree/person/KC8G-J65/details (accessed 17.2.2017)). However no sources are attached. Frances Rose C. Chamberlayne, Totnes, April — June Quarter 1868. Frances Rose C. Chamberlayne, Totnes, July — October Quarter 1868. A second daughter, Elizabeth Amelia, was born a year or so later, on the 7th of November 1869, and died on the 31st of August 1918. She never married. According to FamilySearch, EAC was born 7 November 1869 at St George's, Hanover Square, Middlesex. This is plausible but no sources are attached. Elizabeth Amelia Chamberlayne [daughter], December Quarter, 1869, Totnes. Clifton Villa, St Petrox, Dartmouth. 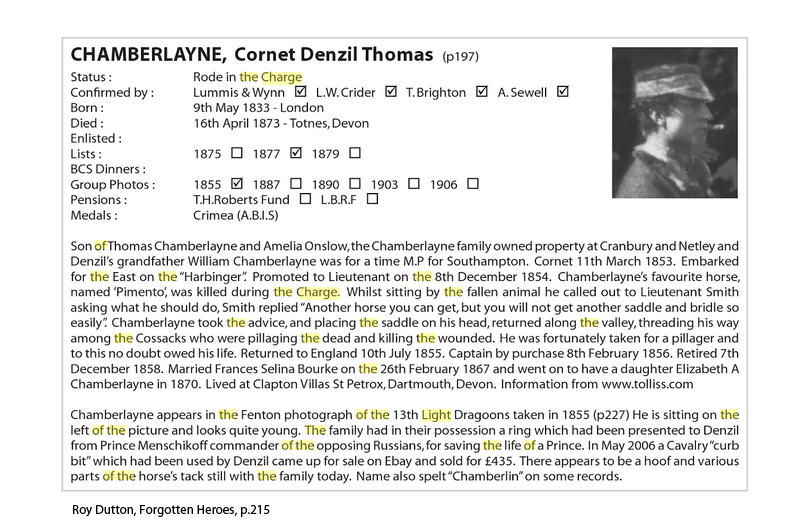 Denzel T Chamberlayne, aged 37, late Captain 13th Light Dragoons, born London. Frances S Chamberlayne, 24, born Wickham, Hants. Elizabeth A Chamberlayne, 1, born Dartmouth, Devon. A House Keeper, Nurse Maid, and a General Servant are also shown. On Tuesday afternoon Sir J. Hannen had before him the cause [case?] of Chamberlayne v. Chamberlayne, a wife's petition for judicial separation on the ground of the husband's adultery and cruelty. The respondent is a retired army captain (being one of the survivors of the Light Brigade at Balaklava), and the petitioner a lady of good family. 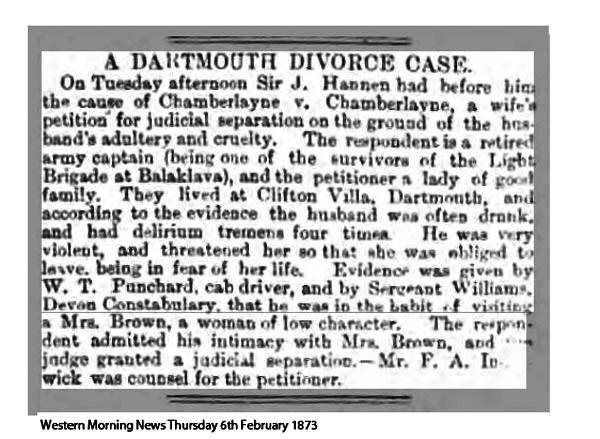 They lived at Clifton Villa, Dartmouth, and according to the evidence the husband was often drunk, and had delirium tremens four times. He was very very violent, and threatened her so that she was obliged to leave, being in fear of her life. Evidence was given by W.T. Punchard, cab driver, and by Sergeant Williams, Devon Constabulary, that he was in the habit of visiting a Mrs Brown, a woman of low character. The respondent admitted his intimacy with Mrs Brown, and the judge granted a judicial separation. — Mr F.A. Inchwick [?] was counsel for the petitioner. He died at Dartmouth on the 16th of April 1873, two months after the judicial separation, and was buried in the graveyard of St Petrox Church, near the castle at the mouth of the river Dart. 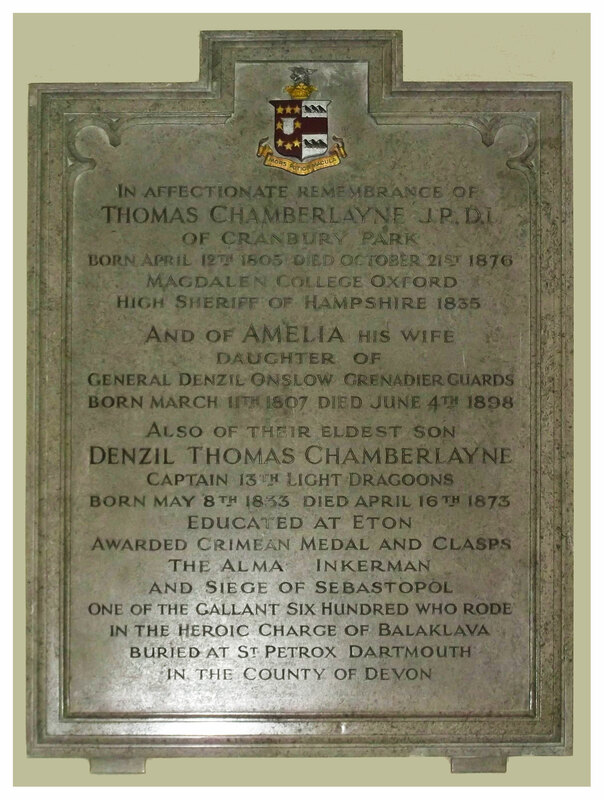 Danzil [sic] Thomas Chamberlayne, aged 38, June Quarter 1873, Totnes. "To the memory of Thomas Denzil Chamberlayne. Late Captain, 13th Light Dragoons. Born 8th May 1833 — Died 16th of April 1873. "The death is announced of Captain D.T. Chamberlayne, of the gallant Six Hundred who took part in the memorable charge of the Light Brigade at Balaclava. Captain Chamberlayne entered the Army as a Cornet in the 13th Light Dragoons, and embarked with his regiment for the Crimea upon the breaking out of the war with Russia and greatly distinguished himself by his coolness and courage in the fatal charge at Balaclava. He rode up to the enemy's guns on the right hand side of Lord Cardigan, at the front of the regiment, and in fighting his way out with the few of his gallant comrades who remained, his favourite charger was shot three times through the body before it fell, and then its gallant rider was seen standing within range of the Russian batteries, the ground all around being ploughed up by shot and shell, coolly taking off the saddle and holsters, and with them on his arm he walked quietly up to the rising ground where what still remained of the gallant "600" had formed. It was there that he was received with a burst of cheering. Captain Chamberlayne was so much beloved by his Troop that when he retired from the Army every man subscribed a day's pay and presented him with a very handsomely chased silver snuff-box and a feelingly expressed address. He died at his residence at Dartmouth on the 16th of April after a long protracted and painful illness." "April 16th. Death. — At "Glenadon", South Town, Dartmouth, Denzil T. Chamberlayne, late Captain 13th Light Dragoons, eldest son of T. Chamberlayne Esq., of Cranbury Park, near Winchester, aged 35. The charger (Pimento) Captain Chamberlayne's old friend, Lord Palmerston, was about to purchase, but most kindly, on his joining the regiment, he handed over to him with these words, "I most willingly waive my right of pre-emption in favour of this young dragoon." He died at his residence at Dartmouth on the 16th ult. after a protracted and painful illness, in the prime of life, and was buried in the most beautifully situated churchyard of St. Petrox, where the remains of an infant daughter also lie." On the 16th of April 1877, DTC's [2nd?] wife married Henry Spencer Wade-Walpole, a Barrister ten years older than herself. Frances S Chamberlayne [former 2nd wife [really?]] to Henry Spencer Walpole, September Quarter 1877, St George's Hanover Square. Henry Spencer Vade-Walpole, aged 74, barrister at law, married 33 years. Frances Selina Vade-Walpole, 64, born Wickham, Hants. Four servants are also shown. Elizabeth A Chamberlayne [daughter], aged 48, September Quarter 1918, Brentford. Frances S V Walpole [2nd wife], aged 78, September Quarter 1924, St George's Hanover Square. Memorial tablet, St Matthew Church, Otterbourne, Hampshire. Adapted from a photograph by Lorraine Boardman, aded 17.2.2016, on the FindAGrave website (accessed 17.2.2017). 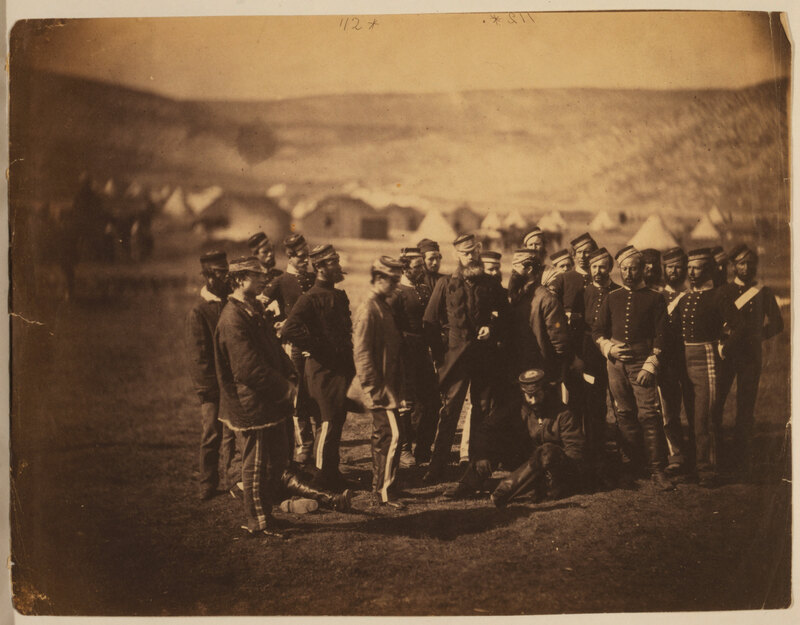 "Sir, here is an interesting little account of the officer at the Charge of the Light Brigade. On last night's 'Antiques Road Show' from Winchester was a very large ornate pipe, with a figure of an Hussar Officer, who was smoking a pipe. He reputedly was a 13th Light Dragoon Officer who survived the Charge of the Light Brigade, then took his saddle and putting it over his head for protection made his way back to the lines. It was Lieutenant Chamberlayne — some rotten sod shot his horse, 'Pimento'. Lieutenant Percy Smith told him to get his saddle and return to the lines, he could get another horse but saddles and bridles were hard to come by. It is believed this saved his life because the Cossacks thought him to be one of their guys nicking the saddle." The memorial is to be found on the top staircase of the Lord's pavilion and takes the form of a nowy-headed wooden board with gold lettering that is accompanied by a framed print giving details of membership, date elected, date of death and place of burial. The club emblem can be found at the top of the board. There are 330 names listed. Lieutenant, 1st Battalion, Coldstream Guards. Killed in action 9th April 1918. Aged 36. Son of Henry Spencer Vade-Walpole and Frances Selina, his wife, of Chipstead, Surrey; husband of Dorothea Frances Walpole, of "The Firs," Stevenage, Herts. Buried in BAC-DU-SUD BRITISH CEMETERY, BAILLEULVAL, Pas de Calais, France. Plot II. Row B. Grave 22. 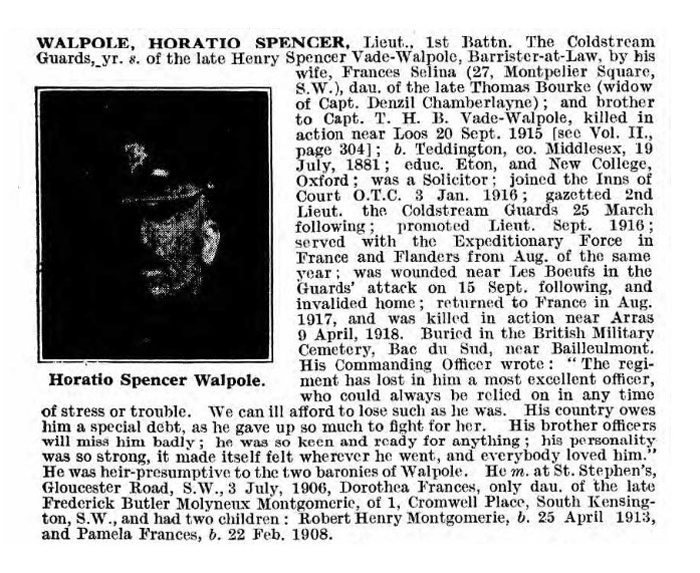 WALPOLE, HORATIO SPENCER, Lieut., 1st Battn. The Coldstream Guards, yr. s. of the late Henry Spencer Vade-Walpole, Barrister-at-Law, by his wife, Frances Selina (27, Montpelier Square, S.W. ), dau. of the late Thomas Bourke (widow of Capt. Denzil Chamberlayne); and brother to Capt. 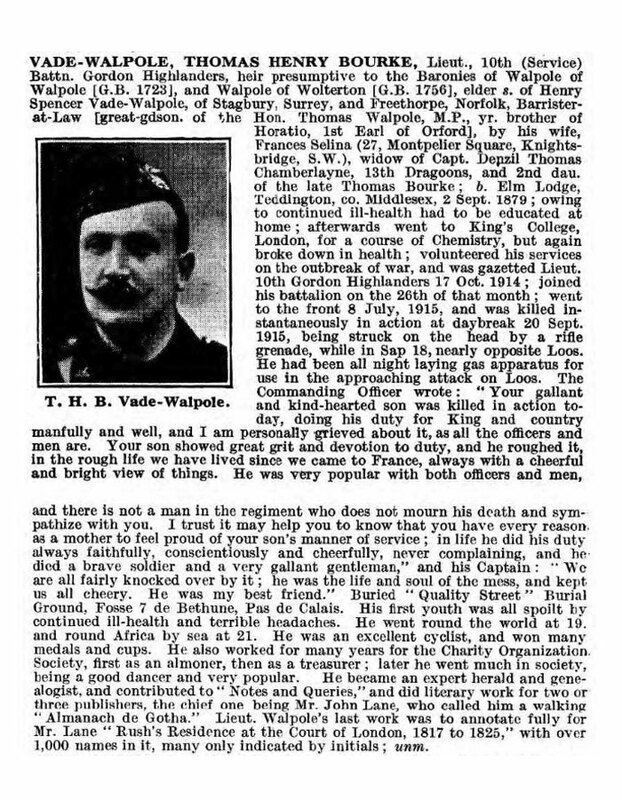 T. H. B. Vade-Walpole, killed in action near Loos 20 Sept. 1915 (see Vol. II., page 304); b. Teddington, co. Middlesex, 19 July, 1881; educ. Eton, and New College, Oxford; was a Solicitor; joined the Inns of Court O.T.C. 3 Jan. 1916; gazetted 2nd Lieut. the Coldstream Guards 25 March following; promoted Lieut. Sept. 1916; served with the Expeditionary Force in France and Flanders from Aug. of the same year was wounded near Les Boeufs in the Guards' attack on 15 Sept. following, and invalided home; returned to France in Aug. 1917, and was killed in action near Arras 9 April, 1918. Buried in the British Military Cemetery, Bac du Sod, near Bailleulmont. His Commanding Officer wrote: "The Regiment has lost in him a most excellent officer, who could always be relied on in any time of stress or trouble. We can ill afford to lose such as he was. His country owes him a special debt, as he gave up so much to fight for her. His brother officers will miss To badly; he was so keen and ready for anything; his personality; was so strong, it made itself felt wherever he went, and everybody loved him." He was heir-presumptive to the two baronies of Walpole. He m. at St. Stephen's, Gloucester Road, SW., 3 July, 1906, Dorothea Frances, only dau. of tbe late Frederick Butler Molyneux Montgomerie, of 1, Cromwell Place, South Kensington, S.W., and had two children: Robert Henry Montgomerie, b. 25 April 1913, and Pamela Frances, b. 22 Feb. 1908. Additional Census information for 1841, 1871, and 1911, details of a number of registrations of births, deaths and marriages, and the newspaper clipping relating to the Chamberlaynes' separation in 1873, kindly provided by Chris Poole. There is a claim at http://www.ancestry.co.uk/genealogy/records/frances-selina-bourke_28069180 that Frances Selina Bourke was born in Jamaica, West Indies in 1857 to Thomas Bourke and Selina Onslow. I have have found no evidence for this. DTC in Roy Dutton, Forgotten Heroes, p.215. Dutton says went out on the "Harbinger" / "Info from www.tolliss.com" ? / A ring from Prince Menshikoff? / Curb bit?